As we are coming through winter when the ground is at its hardest, it is worth thinking about the ways we work and exercise our horses. As every horse owner knows, the feet and legs are a horse's most valuable assets and will determine the health and duration of its working life. But this doesn’t just involve the hooves and bones and many tend to forget the joints and the role they play in maintaining sound conformation. 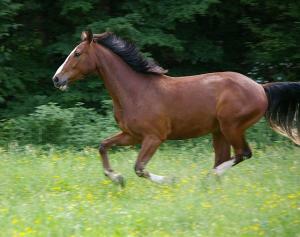 If you suspect your horse has a joint injury, contact your veterinarian straight away. If you don't, the condition will only get worse, affecting other regions of the horse such as the other limbs, back and hips, leaving you with a much bigger problem on your hands. Lameness and reduced performance are the most obvious signs that something is wrong with your horse, as are visible signs of swelling and evident pain when moving. While there are no guarantees that your horse will never experience joint problems, there are several things you can do to strengthen and support its joints year-round so that come summer when the ground is hard, your horse is good to go!